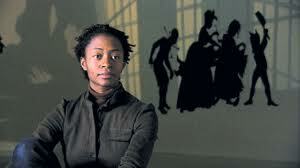 Kara Walker Does it Again! “We at Camden Arts Centre are Exceedingly Proud to Present an Exhibition of Capable Artworks by the Notable Hand of the Celebrated American, Kara Elizabeth Walker, Negress.” The full title - sardonic and incendiary – in verbose 19th century vernacular style, captures the spirit of Kara Elizabeth Walker’s first major UK solo show. Occupying three stark, minimalist galleries in the Camden Arts Centre, the provocative exhibition showcases important examples of the African American artist’s recent work. Ms Walker’s signature silhouette figures dominate, but are complimented by powerful graphite drawings and the controversial shadow-puppet animation Fall Frum Grace, Miss Pipi's Blue Tale. The Centre also devotes its impressive space to a programme of films selected by the artist, talks by specialists, musical playlists, and a reading room where a short film featuring a piece-to-camera by Walker is screened. The Atlanta College of Art graduate’s pictures are peopled with subjects from the past and more recent episodes [although not included here she has focused recently on the dehumanisation of those affected by Hurricane Katrina.] Using deep research into the USA’s gun culture and White Supremacist ideology which she parodies - the daughter of equally acclaimed artist Larry Walker - uses her art to revisit and translate the country’s mythology. The imposing charcoal sketches which dominate the arctic white walls of Gallery 1 are from Dust Jackets for the Niggerati - a collection surveying key phases in African American history. Mostly shadowy and obsidian, the images are haunting and profound, enticing the viewer to inspect, examine, and investigate further. More than simplistic sketches – see her subjects expressive faces – they deliver shrewd comments on enslavement, the US Civil War, the post emancipation Reconstruction Period, migration and historical and contemporary racist violence. The centrepiece - and most unsettling - is The Daily Constitution 1878 (2011), which recreates in excruciating detail a news story from the Atlanta, Georgia newspaper. The violent graphite drawing that documents the hideous lynching of an unnamed Black woman; where the gruesome yet ingenious crime of the perpetrators makes the scene even more disturbing. That violence, racism and the KKK (Ku Klux Klan) - the motive for the mass migration from south to north of thousands of African Americans - overshadows African American history is the immediate reaction to Urban Relocator in which a ghoulish cloaked Ku Klux Klan figure tends a cotton plant. This and the striking Another Ancestor, are cryptic - hidden messages and concealed signs that need more than a glance to absorb and understand. The altogether different atmosphere of the larger Gallery 2 is mostly given over to Ms Walker’s trademark silhouettes. With Auntie Walker’s Wall Samplers for Civilians and Auntie Walker’s Wall Sampler for Savages - white on black walls or black on white walls – the Columbia University professor of visual art shows her expertise in the discipline’s history. At its birth, this genre was infused with the pseudo-scientific racism of brain measurements and twisted readings of physiognomy. Satirising stock characters from the USA’s past, the artist’s intelligently-conceived pieces are astute and sharp. Ms Walker not only probes contemporary issues but additionally, many of the 18th century style cut-outs likewise focus on topical events as well as articulating the brutality and violence of US history. Also recalling the tradition of Black ephemera, in which people of African descent are [mis]represented in advertising and memorabilia as subhuman curios, the artist’s stencilled profiles, question American folklore. Fearless comments on racist imagery [mammy figures, and minstrels, grinning picaninnies, savages, cannibals, golliwogs, hyper sexed animalistic Black men and seductive Black women] parody the standard caricatures of Black people. By mocking the foundation of these racist imageries and cultures, Ms Walker’s poignant art twists and subverts - the predator becomes prey, and is disempowered and belittled in the process. Fall Frum Grace - Miss Pipi’s Blue Tale screened in the dim, high-ceilinged Gallery 3, is a video installation combining stop-frame silhouette animation with snatches of photography. Dramatising an encounter between an enslaved African and the forbidden fruit fantasy that is a white woman - the pretext cited to murder thousands of Black men in horrific ritualistic killings – the 18 minute narrative both shocks and amuses. Tapping into the subliminal connotations which underpin US history Walker navigates a dangerous artistic precipe. Though unsettling, Ms Walker’s work is skilful and inventive – she succeeds because her art is also radical and enlightening.